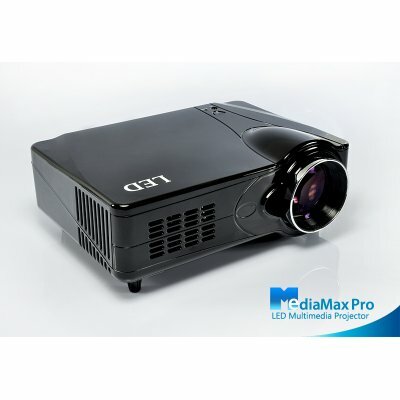 Successfully Added MediaMax Pro - LED Multimedia Projector (DVB-T, HDMI, VGA, AV) - Black to your Shopping Cart. It's just another day of enjoying your home entertainment projector when all of a sudden you see the dreaded lamp warning indicator telling you it will soon be time to replace the projector lamp. What a pain. Isn’t there a projector that is maintenance free? Well, good news - there is! Introducing the MediaMax Pro LED Multimedia Projector! No more worry about replacing lamps: our MediaMax Pro – LED Multimedia Projector features cutting-edge LED technology and offers up to 50,000 hours lamp life. It can last for more than 30 years even if you use it for 4 hours a day. Additionally, the LED light source consumes less energy than traditional lamp-based projectors and is mercury free. It’s an eco-friendly choice. But this is not the only benefit of choosing an LED projector. Reduced Fan Noise for Less Distraction: compared to other mediocre projectors on the market, the MediaMax Pro is ultra silent as it operates with an almost unnoticeable fan noise of only 25 db, which is the same as a name brand laptop. This translates into less distraction during presentations, or when viewing movies or playing games. Improved Image Quality for Better Viewing Experience: The LED light source delivers a wider color-range and deeper color-saturation than traditional lamps (for example HID) and thus enables the MediaMax Pro to provide vibrant and crisp clear images for any type of media from videos and TV to PowerPoint and Excel files. The MediaMax Pro has more to offer. It’s a truly multimedia projector for you to input HDMI, VGA, SCART, Composite and Component AV devices and start viewing them in big screen comfort. If this is not enough, then just turn on the built-in DVB-T tuner and watch your favorite programs! Or plug in your USB thumb drive or SD card and start enjoying your movie or music collections! This amazing LED Multimedia Projector is now available in stock for single or bulk order. Order a sample today and we will express ship it out to you tomorrow. Brought to you by your source of China factory direct electronics - Chinavasion. The product supports worldwide voltages (90 – 240 V, 50, 60 HZ). So is it an LED projector or an LCD projector? To be technical, it's a LCD projector with an LED bulb. But most people use the terms interchangeably.